Articles are best ways to get free traffic when it comes to online marketing. You can put these articles on various directories like EzineArticles, GoArticles etc. You can also use these articles as a blog postson your site/blog. Try to tweak the headlines and content before putting them on articles directories and blogs. Learn more about article directories and blogs by clicking here. 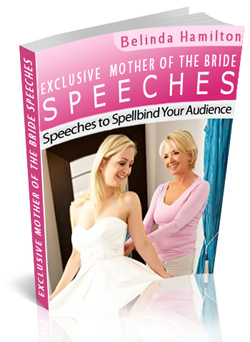 The following banners and ecovers have been provided for your use in promoting the Exclusive Mother of the Bride Speech book. 1. Please choose the banner/ecover you would like to use on your web site. 2. Right click and save the banner/ecover to your computer. 3. Upload the banner/ecover to your web server. 4. Place the image on your web site in the location you would like it to appear. * Make sure to replace "zzzzz" with your ClickBank Nickname so that you will receive a commission on any sales that come through your affiliate banner/ecover on your web site. If you need help with installing your banner/ecover, please contact us. More resources coming soon in the mean time if you need any help or have any questions feel free to contact us.